The umbilical cord is the lifeline of the fetus. Complete cord occlusion often leads to fetal demise while intermittent obstruction has been associated with intrauterine brain damage. Cord compression and vasospasm are important factors in fetal distress. Careful umbilical cord examination often reveals significant lesions which may be associated with these processes. The umbilical cord forms in the region of the body stalk where the embryo is attached to the chorion. This area contains the allantois, omphalomesenteric duct, vitelline vessels and evolving umbilical arteries and vein. The expanding amnion surrounds these structures and covers the umbilical cord. Eventually most of the embryonic elements as well as the right umbilical vein disappear, leaving two arteries and one vein (Figure 3.1). Embryologic remnants are frequent on microscopy, but are rarely visible grossly. Allantoic remnants show a transitional-type epithelium and occur most often near the fetal end, between the arteries. Omphalomesenteric remnants may be ductal and lined by gastrointestinal epithelium or vascular (Figure 3.2). The absence of one umbilical artery is a common anomaly, occurring in about 1% of deliveries (Figure 3.3). It is more frequently seen with twins and velamentous cord insertions. About 20% of infants missing one artery will have other major congenital anomalies which may involve any organ system. Many are of chromosomal etiology. The abnormalities are generally apparent in the neonatal period, except for the increased incidence of inguinal hernias. The "nonmalformed" infants missing one umbilical artery are slightly growth-retarded overall and have increased perinatal mortality. Cord accidents have been unusually frequent in this group. Figure 3.1. A normal three-vessel cord contains two arteries and one vein. The arteries are often more contracted than the vein, but it is not always possible to identify the type of vessel grossly. 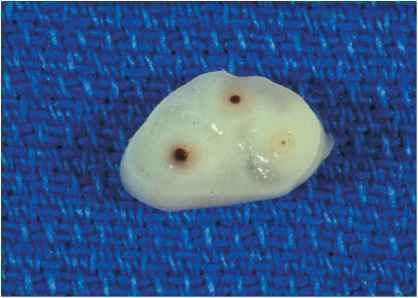 Most embryologic remnants are too small to be seen by eye. Figure 3.2. The small zigzag vessel on the cord surface is a vitelline vascular remnant. Under the microscope these have no muscular wall and are sometimes multiple suggesting a hemangioma. 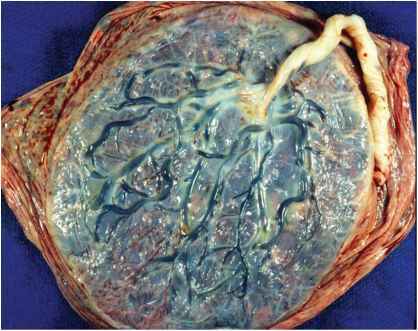 The dilated blue area is a small "false knot," an area of redundant length of the umbilical vein. Figure 3.3. 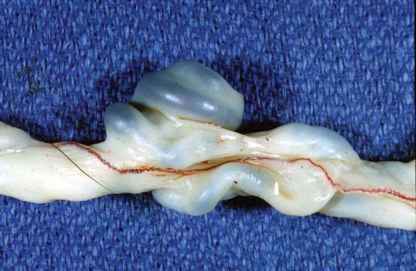 An umbilical cord with a single umbilical artery shows only two vascular lumens. Frequently the two arteries fuse in the last few centimeters of cord above the fetal surface, thus multiple cuts along the cord should be made to confirm the number of vessels. Figure 3.4. Umbilical cord twist is established early in development, as shown in this 10-week gestation. It usually twists in a left or counterclockwise direction (7:1). Figure 3.5. 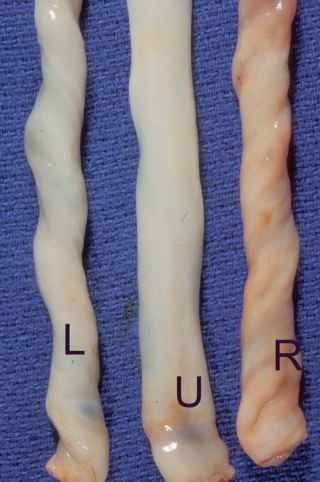 Umbilical cords showing left (L), absent (A), and right (R) twists. Infants whose cords lack a twist exhibit more perinatal morbidity. Cords missing one umbilical artery are also more frequently untwisted. No other correlations with fetal outcome have been identified. Figure 3.6. It is not unusual for a cord to have regions with differing directions and density of twisting. Here a right twisted cord becomes an untwisted one. How does umbilical cord twist? How does the umbilical cord form from the umbilical stalk? How to twist an umbillacle?